Vegetables love sunlight. Sunlight promotes photosynthesis, which aids in the production of carbohydrates. Carbohydrates are one of the components of good flavor and of nutrition, but in the summer, sunlight = heat; and it can get pretty tough in our zones. From October through May it is a pleasure to grow a vegetable garden, but from June through September shade is pretty much the only comfortable place to be outside. I know gardeners who only plant a fall and early spring vegetable garden. They won’t fight the summer heat. During summer they restrict their gardening activities to their shady spaces and give up growing vegetables. Gulf Coast gardeners love shade. We need shade. We couldn’t get through our summer heat without it. So we plant shade trees or erect shade structures to make our outdoor activities more comfortable. But in doing so we cut down on vegetable growing space, right? Not necessarily. In reality, shade can be a vegetable gardener’s friend as long as we get to know it and understand how to optimize it. Gulf Coast summer sun and heat is simply too intense for some vegetables. They will wilt, bolt, or become tough or bitter. There are vegetables that will grow quite well in shady spaces during summer. Shady spaces can be a great season extender for veggie gardeners, but you have to know your shade in order to do this well. Please read our page The Shade Dictionary. It will help you understand the quality of shade in your landscape, and to manage the conditions in Dry Shade and Moist Shade. The two main activities throughout the growing season are irrigation and fertilization. Vegetables grown in shady places will benefit from some form of low volume irrigation – drippers or micro-sprayers. In dry shade under trees this is especially important. A tree’s feeder roots are concentrated at the drip line and can extend 1.1/2 to 4 times the width of the canopy. The leaf canopy diverts rainfall to this drip line. The rainfall that does make it through the canopy will be taken up by thirsty tree roots located there. The under-planting will come in second. Supplemental irrigation is required. You want to irrigate, but not saturate. The veggies need sufficient water but we don’t want to use any practice that could weaken the tree or create conditions that would promote disease. Low volume irrigation practices apply water directly to the plants roots. It will provide a bit of supplemental water to the tree, but will not saturate the ground deeply. Low volume irrigation is also a good way to manage moist shade areas. Since it places the water right at the root zone of the vegetable, you will not be contributing to keeping the area water-logged. Between the soil improvement program and good watering practices the entire area will benefit over time. 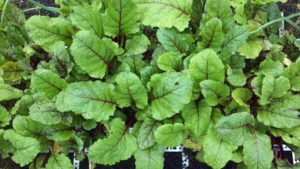 Fast growing vegetables like lettuce and other greens will generally be happy with the handful of fertilizer they are planted with. Longer season vegetables will benefit from an occasional side dressing of your favorite slow release organic fertilizer. There is no real reason to work it into the soil, although you certainly can if you wish. Broadcasting it at the base of the plant is sufficient. What can I grow in my shady spaces? These vegetables and herbs need 3 – 6 hours of sun daily. None of them would grow well in full, deep shade all day. For example, veggies planted on the east side of a tree or structure will get several hours of sun during the morning only. This is a great condition for leafy greens and root crops. Plants located on the west side of a tree or structure would receive several hours of afternoon sun. This more intense sun is a good condition for plants like snap beans, peas, and garlic. A full day of dappled or filtered sunlight is usually sufficient. Containers are a good way to play with learning your shade quality. All of the plants listed above can be planted in containers. If they do not seem to be getting sufficient light in any area, the container can be moved. On the other hand, if you notice that a container of lettuce is suffering from too much exposure as the temperatures rise, you can move it into deeper shade. Some of these vegetables can be grown in a container as small as 6”. The majority of them will grow quite happily in anything larger. The best way to become an expert shade gardener is to experiment. It will only take a season or two to really get to know your light exposure and micro-climates you can manipulate in our summer months. 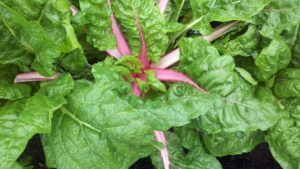 You will also learn which varieties of your favorite vegetables and herbs are more suitable for the conditions in your own yard. A good strategy is to start out with a flat of transplants and buy your seed packets at the same time. Set the transplants out right away then fill the empty pots with a good seed starting mix and plant a pinch of seeds in each within a day or two of setting out your purchased transplants. As soon as the transplants are ready to harvest, your seeds will have germinated and grown to transplant size. They may be a little smaller than a nursery transplant, but as long as they are 2” – 3” tall they will thrive. This will start a succession planting cycle that you can enjoy for months.